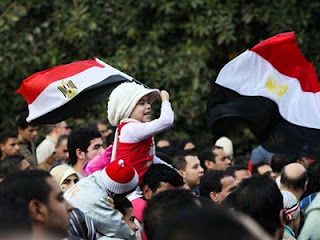 Greetings and respect to you, the people of Egypt. During you heroic struggle against totalitarianism , as a friend of liberty I had kept my fingers crossed and heart hopeful. Now that you have finally achieved your freedom, I congratulate you on your achievements. My heart leaps with joy to see that you've inspired millions of people around the world to wake up, get organized and fight against the enemies of liberty and banes of humanity. Like you I have my fingers crossed and prayers sent to them too. I sincerely hope someday we'll ALL be free and all our societies will be open and accommodate everyone's freedom. I am sure that human spirit will triumph the countless oppressions as we can see in our history, it has always been so. Now that you have achieved you freedom, I would suggest you to have a careful watch on it as a wise person once said, "Eternal vigilance is the price of liberty." Freedom is always at the brink of extinction. I pray that you do not to make a mistake as we Nepalese did and let 601 dictators rein in the place of one dictator. I pray that you not let the so called leaders capitalize on your struggles and fulfill their own interests like it happened to us. I pray that you to think for everyone and respect everyone's rights EQUALLY. I pray that you not to take the path of vengeance but of forgiveness and make your nation as such that every individual's life and freedom is cherished and the fruits of their labor is well protected which we haven't been able to do. As you have now experienced the dangers of totalitarianism, I request to keep your powers with yourself and delegate only the necessary powers to the politicians /state. As they say, power corrupts and absolute power corrupts absolutely, please refrain from giving more power to the state and breed corruption. A society based on mutual respect and strong rule of law is the only society worthy for humans.I want to reiterate that only free people of a free society can take the human civilization forward. I am sure that the belief that free people when protected from forceful aggression of others and otherwise left on their own, will always find their own path to progress through their creativity, courage and voluntary cooperation will come true in your case. You have shown the world how peace can conquer oppression and inspired the whole world to do the same. And I somehow think, if things continue to be the same in Nepal, someday we will be following your footsteps too. I thank you for this and pray that you don't let your struggles go in vain by letting the enemies of freedom who come in various names and disguises have a upper hand in your society. And with all my heart I pray for the success of Libyan people in their quest for freedom. May freedom prevail!